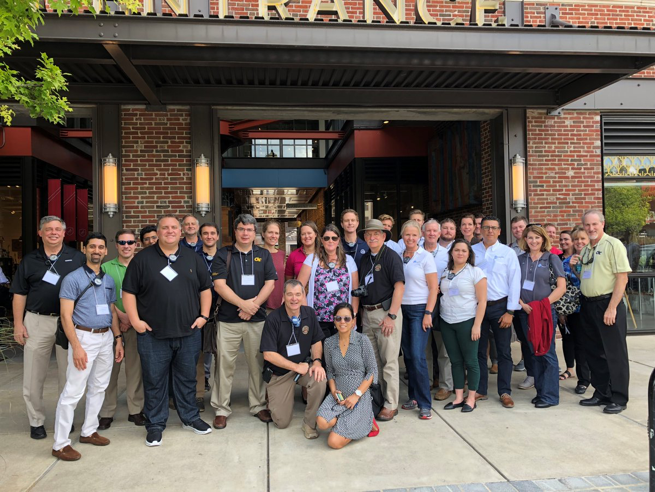 Georgia Tech’s Smart Cities and Inclusive Innovation Initiative was excited to host the GA Public Service Commission’s Smart Cities Roundtable and North Avenue Smart Corridor Tour on Friday, September 21. PSC Commissioner, Tim Echols, along with Troy Galloway (ReNew Atlanta), Christine Primmer (Georgia Power), and Debra Lam and Michael Hunter (Georgia Tech) addressed the group. Commissioner Echols noted that investing in “smart” technology takes a lot of collaboration and it is important to get state agencies involved and informed. Troy Galloway explained how the ReNew Atlanta Bond Referendum/TSPLOST funds are turning North Avenue into a “smart” corridor as cameras and infrared detection are being used to garner information to help change traffic patterns and increase safety for pedestrians and bicyclists. Georgia Power’s Christine Primmer discussed their SmartATL Initiative which extends beyond the North Ave corridor to several regions across the city. Using first-of-its-kind hardware, IQ nodes collect thousands of data points per day using cameras, audio, and environmental sensors. Lastly, Georgia Tech’s Michael Hunter discussed how his research along the North Ave corridor is taking data and “making it actionable!” After the roundtable concluded, the group boarded low speed electric vehicles to view the North Ave Smart Corridor firsthand stopping along the way at Georgia Tech’s Carbon Neutral Building, Coca-Cola One, Georgia One/GDOT and Ponce City Market!